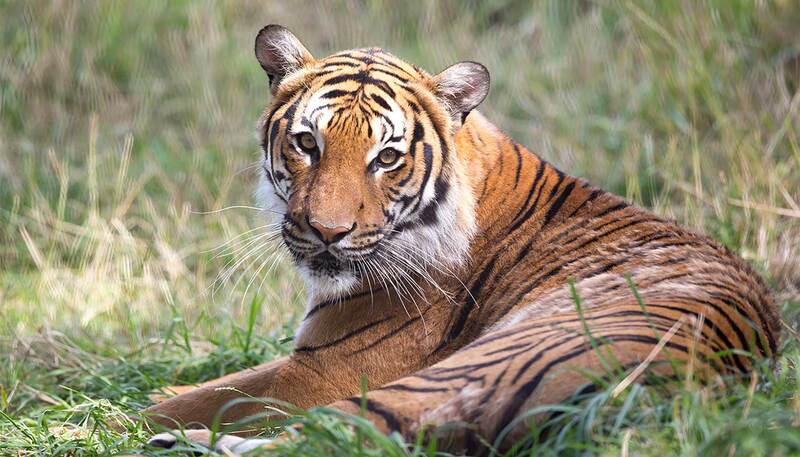 Woodland Park Zoo and Panthera, a global wild cat conservation organization, established a ten-year, $1 million partnership in 2012 to enhance tiger conservation in Peninsular Malaysia as part of Panthera's Tigers Forever Program. In collaboration with local, on-the-ground partners in Malaysia, and in concert with Malaysia’s National Tiger Action Plan and the country’s Department of Wildlife and National Parks (DWNP) (“Perhilitan” in Malay), the Woodland Park Zoo-Panthera Malayan Tiger Conservation Partnership conserves critically endangered tigers and the forests these iconic big cats call home by identifying tiger breeding populations (tiger “hotspots”) and mitigating threats, including poaching and habitat fragmentation. Rimba and Pemantau-Hijau, two Malaysian nonprofits, oversee the project’s long-term tiger ecology and population survey research as well as species protection efforts, which include training rangers in the latest anti-poaching patrol strategies and effective law enforcement techniques to pull the Malayan tiger back from the brink of extinction. It takes a team effort to monitor and protect critically endangered tigers and other threatened carnivores in our project’s rugged landscape, which encompasses a core area of 1,000 km2 (approximately 247,105 acres) in the northeastern part of Taman Negara National Park and the selectively logged forests of the Kenyir Wildlife Corridor, both set within the 15,000 km2 Greater Taman Negara Region (approximately 3,706,580 acres). Our partnership has assembled a solid, innovative network of conservation professionals including scientists and law enforcement specialists. We provide financial and technical support to Rimba and Pemantau-Hijau, which share expertise and collaborate with DWNP, state government officials, other conservation organizations, and indigenous communities. Since 2012, we have helped support five tiger conservation training workshops with the help of experts from Panthera, the Malaysian Conservation Alliance for Tigers, and the Wildlife Conservation Society. These capacity-building exercises have: 1) trained more than 50 park rangers and managers on field data collection methods; 2) improved anti-poaching patrols; and 3) improved communication among state and federal government agency personnel and local, nonprofit wildlife biologists. Rimba recently assisted DWNP in setting up nearly 200 camera traps throughout the research site’s grid to obtain baseline information on the status of tigers and other threatened species living in it, including leopards, clouded leopards, sambar deer, Malayan tapirs and Asian elephants. Also in that year, Pemantau-Hijau monitored human activity at access points into the project area to enhance the effectiveness of DWNP’s anti-poaching efforts. We aim to enlarge the coverage of our research and protection activities to discover new tiger hotspots as well as focus increased surveillance on known hotspots within the core area and the Kenyir Wildlife Corridor. We will: 1) expand our tiger monitoring project area, focusing especially on known tiger hotspots; 2) increase data gathering relevant to Malaysia’s Department of Wildlife and National Park’s (DWNP’s) law enforcement actions; 3) assist DWNP with the design of a tiger survey to take place in another potential project area in Taman Negara; 4) conduct training workshops on camera trapping methods for park biologists and rangers; and 5) assist DWNP with a planned reintroduction project for sambar deer, an important tiger prey species discovered in 2014 to be in low numbers in our project area. Just over 100 years ago there were as many as 100,000 wild tigers living in Asia. Today there are fewer than 3,200 wild tigers with only 7% of their original habitat remaining in 13 Asian countries. Half of all tigers are found in India (the “Bengal tiger”). Conservationists are focused on identifying and protecting the remaining breeding tiger populations, safeguarding tiger prey, and securing sufficient protected areas and connecting corridors for long-term tiger survival. In the last 80 years, three types (subspecies) of tigers, Javan, Caspian and Bali, have gone extinct, and the South China tiger has not been seen in nature for 25 years and is considered extinct in the wild. Five subspecies remain to be saved, each with distinctive habits and anatomical characteristics: Amur, Bengal, Indochinese, Malayan and Sumatran. Woodland Park Zoo has devoted its effort and focus on one subspecies of tiger: the Malayan tiger. These critically endangered animals are only found in Peninsular Malaysia. We estimate that there are only 250-350 Malayan tigers living in the wild. Time is running out to save them from poaching – but it is not too late! Woodland Park Zoo’s Banyan Wilds exhibit is home to Malayan tigers and other Asian forest animals. The WPZ-Panthera Malayan Tiger Partnership is highlighted in the exhibit’s Field House, a conservation action center where visitors can learn how they can take action to join the effort to save tigers before it’s too late. Panthera, founded in 2006, is the world’s leading organization devoted exclusively to the conservation of wild cats and their ecosystems. Utilizing the expertise of the world’s premier cat biologists, Panthera develops and implements global conservation strategies for the largest, most imperiled cats – tigers, lions, jaguars, snow leopards, leopards, cougars and cheetahs. Representing the most comprehensive effort of its kind, Panthera works in partnership with local and international NGOs, scientific institutions, local communities, and governments. It has conducted over 200 wild cat conservation projects, carried out projects in 70 countries and provided scholarships to 69 graduate students to cultivate the next generation of cat experts and conservation leaders around the world. Panthera conducts tiger conservation work in 14 sites across six tiger range states, representing more than 30% of the world’s most critical tiger populations. It has dispersed more than 4,000 Panthera-developed camera traps, the leading model on the market and best method to monitor tiger populations, and obtained the highest tiger population density estimate ever reported for tigers in Sumatra. Panthera also launched the Tiger Task Force, a network drawing together experts in the fields of tiger ecology, policy, law enforcement, monitoring, and technology. Rimba, which means “jungle” in Malay, is a nonprofit research group of biologists conducting fundamental and applied studies for the conservation of threatened species and habitats in Malaysia. Established in 2010, Rimba’s work yields evidence-based management recommendations to help decision-makers reduce or halt threats to ecosystems and species. Their expertise encompasses biodiversity assessments and monitoring, ecological and land use change modeling, human-wildlife conflict mitigation, indigenous people’s issues, road impact mitigation, and issues related to sustainable forest management, wildlife corridor and the illegal wildlife trade. Pemantau Hijau, which means “green monitor” in Malay, aims to support researchers and government agencies in monitoring Malaysia’s changing natural environment. Equipped with state-of-the-art technology such as unmanned aerial vehicles (UAVs) and encroachment detection cameras, our team can help researchers and government agencies achieve real-time detection of activities threatening natural resources. This is to ensure that natural resources in Malaysia do not experience further declines from land encroachment and unsustainable resource extraction.